This February had loads of paperwork, as usual. Fortunately for me, Valentine’s Day came right after I finished my taxes. Time for yummy loot! 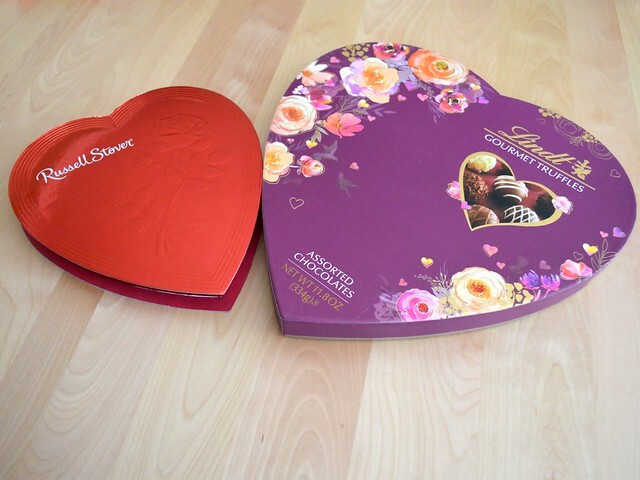 We usually buy Valentine’s Day candy only after it has gone on sale, so, perfect timing. Weatherwise, this February was oddly low-snow. We did get a number snowfalls, but they were relatively few and far between. In the very beginning of the month, we had a load of light, fluffy snow, with sun and high winds the following day. 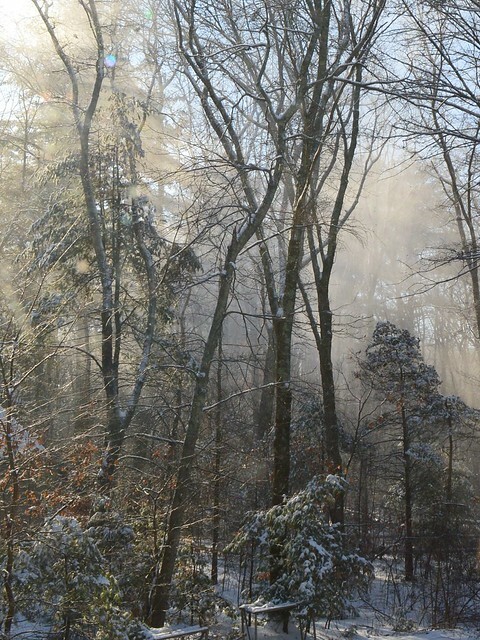 The powdery snow fell off the trees in huge, gorgeous, transparent curtains, almost like mist. My photo doesn’t do it justice at all; it was magnificent! So many different paths all over! 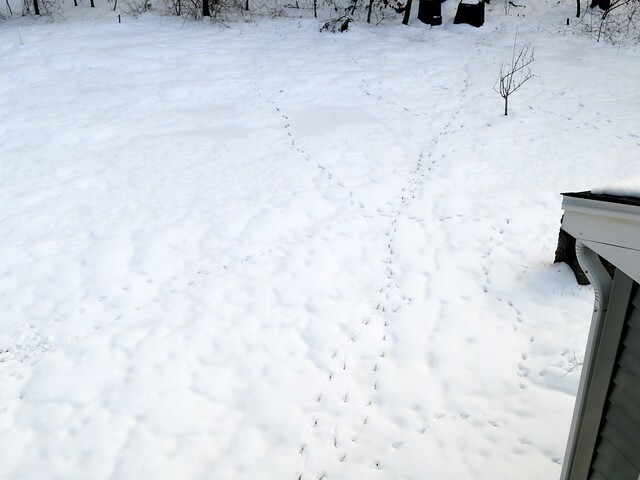 There’s also at least one set of fox tracks there. 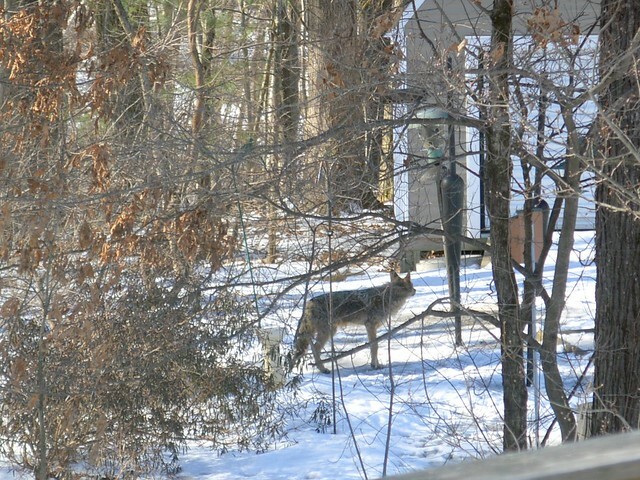 And speaking of foxes, one Saturday, a bright and glorious morning, one came round to check around the bird feeder in our neighbor’s back yard. Sadly, the latter half of February brought two deaths in Husband’s extended family, which cast a pall on otherwise sunny days. I hope your year is still off to a good start. Speaking of cycles, tax time is rolling around again. I’ve been bogged down with tax prep more than usual at this time of the year. Unfortunately, Etsy changed the way they bill and pay their sellers at the end of last year. The new system has had some glitches which have increased my bookkeeping workload significantly. I can’t wait to be done with the 2018 number crunching and get onto the tax forms themselves because it’ll feel so much easier – something I never, ever, thought I’d say! Just past mid-January there was a snowstorm, the first snowfall for the year. Then a front of warm weather with rain pushed through and melted almost all of the snow. It was very pretty for all of four days! One night right after the snow, we had someone scamper across our yard. 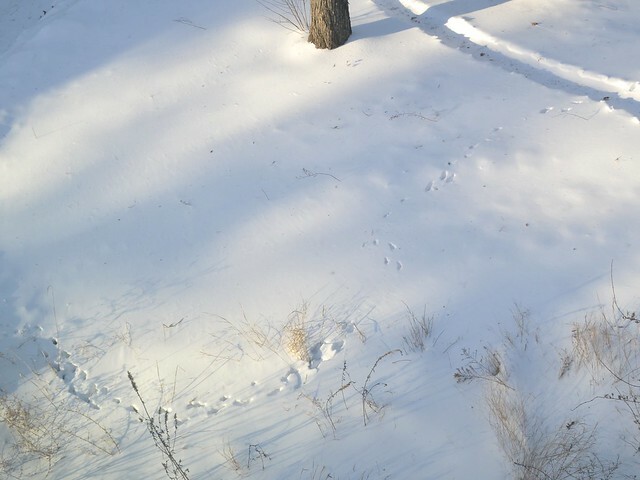 There’s a funny gap in the tracks (in the middle of the photo), though, which makes me wonder whether it might be a sign of a fox jumping to try and catch a critter under the snow. Like in the gif below (but probably much less showy). From left to right, How Long ‘Til Black Future Month? 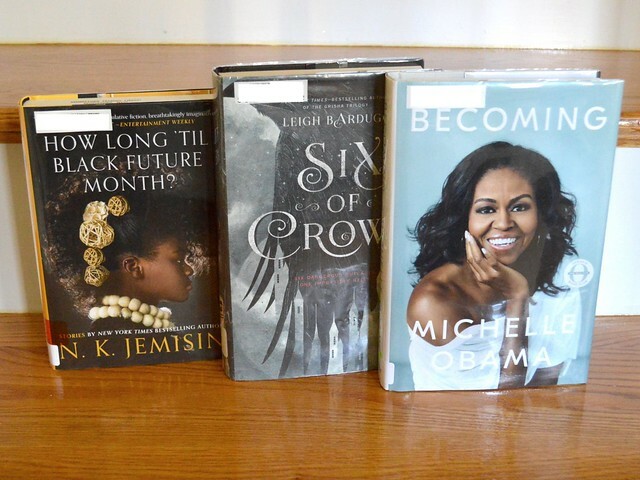 by my favorite living author Nora Jemisin, Six of Crows by Leigh Bardugo, and Michelle Obama’s autobiography Becoming. I also read Ariah by R.B. Sanders and Zero Sum Game by S.L. Huang. I’m looking forward to the last two Murderbot novellas, too, which I got as Christmas present. Yay, so many great reads! On the screen, Husband and I were introduced to the tv series Modern Family by a friend. It’s a mocumentary of three generations of a Californian family. We’re bingeing through the seasons and have gotten up to seven, and are still enjoying it. My goodness, I never would’ve thought that I’d find a mainstream (i.e., non-genre) family drama interesting, but I do. 🙂 Shows you what production values can do – specificially in this case, attention to quality character-writing and episode structure. Now that I’ve written a full year’s worth of recap posts, it’s time to reassess. Even though it felt difficult at times, I certainly learned a lot and found that I do like an end-of-the-month look back. I’m inclined to continue these newsletters, but I might dink around with the topics or proportions. Would you like to read more about something or maybe less about something else? Please let me know! 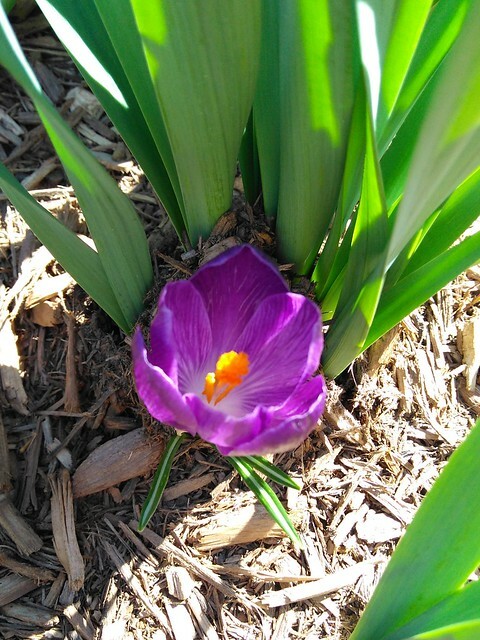 Husband and I got off easy, all in all – apart from copious snow-shoveling, our immediate area didn’t suffer badly. The only blackout in our neighborhood lasted less than 24 hours, and damage on our street was limited to one downed wire (with no street plowing, however, because the truck couldn’t get past it). Plus some fallen trees in the woods, but that’s normal. Speaking of hearts, I’ve been making prototypes of small heart ornaments. So far I’ve only made singletons, but I’m hoping to find a handy way to string them up as a banner. I was really exited about our spring break trip to visit family in Virginia. For a while I was worried we might not be able to make it – our flight left the morning after one of the major snowstorms. Luckily, the airport was running more or less normally by then. (The crews must’ve pulled an all-nighter – thank you!) It was fantastic to be able to enjoy the warmer weather plus first leaf buds and blossoms in the valleys. Up in the Blue Ridge Mountains nature was, understandably, not as far along, but the views were still very beautiful. We happened to visit on a clear, bright, sunny day – the vista went on and on! “This is a no go area for all fascists, racists, sexists and homophobes. It wasn’t even the only anti-bigotry expression we saw. Clearly the city was deeply affected by the death of Heather Heyer in August 2017. Instead of designing and sewing, most of my mental capacity this month has been derailed into dealing with taxes. I belatedly found an error in my 2016 return, and had of course to check all previous ones to see whether it tracked further than that. The end is in sight, though – almost done with the amendment and the 2017 return! This month started with finalizing and submitting the first tax-related return of the year. And there was much rejoicing! I also had the (ahem) joy of hanging on the phone with my bank to try and solve a month-long issue. Fortunately their team did eventually solve the mystery glitch. I am so thankful – YAAAAY for tech support! I’ve been working on small piecing / quilting prototypes (think placemats or table cloths) made from two different sizes of squares. Unfortunately, a third type of paperwork issue slowed me down – I haven’t been able to proceed as fast as I’d like. That’s part of the creative life, though. 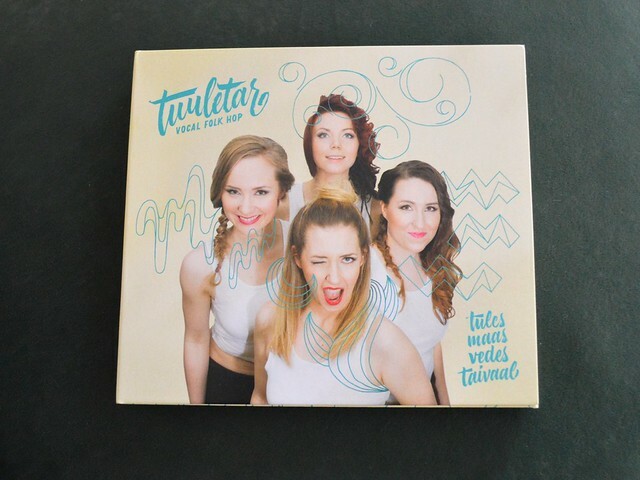 While sewing, I’ve been enjoying vocal folk hop by Tuuletar in my native Finnish. Blog posts on the group here and here. And we saw Black Panther, and it was glorious! Here are the more significant things from January 2018. Preparing my tax returns is always an involved process, so I start as early as possible in the beginning of January. As part of tax prep, I check my inventory. That is a year-end task that takes quite a bit of effort, energy and elbow grease. On the other hand, every time I go through my stash I’m reminded of a fabulous fabric or another and get inspired. I also need to submit documentation for assigning property taxes for my business. This is the first tax-related return of the year. Work was slowed down by snow storms in late December and early January. The 2018 winter storm Grayson brought some 13″-15″ / 33-38 cm of snow for us. And this on top of the first two snowfalls of the season, about 10″ / 25 cm total, that didn’t have time to melt. I was afraid we’d end up with snow up to our nostrils (like a few winters ago). Fortunately it doesn’t look likely anymore, although February might yet surprise us. I also got a Jane Austen 10 GBP note of my own! Fansquee! And, heartbreakingly, while I was reading her Tales from Earthsea, Ursula Le Guin passed. Her passing was such a bittersweet moment, bitter because she won’t be producing any more work. However, the many tributes serve to remind us of her intellect, inner fire and vision. 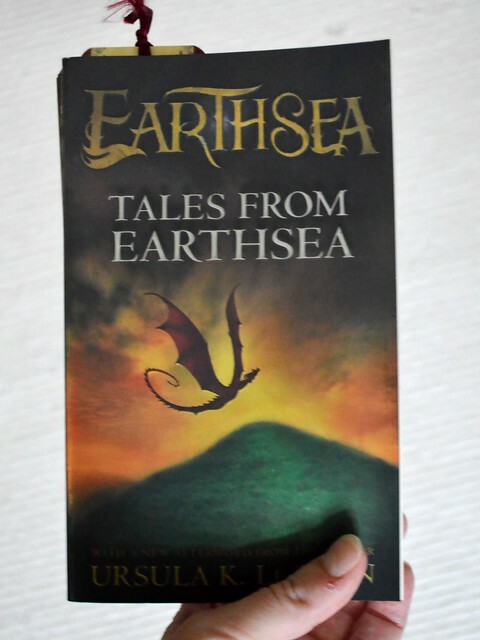 I’m most fond of Le Guin’s Earthsea stories, some of which I’ve read and re-read in Finnish and in English over the years. I’ve only managed one of her science fiction books so far, though. Time to rectify that. I’m done with both my business property and income taxes. And there was much rejoicing. Best filing practices by Akire Bubar. Seriously though, I’m really proud of having gotten my property taxes done almost a month before the deadline, and income taxes a month and a half. It’s been a lot of work, but the peace of mind is worth every moment. The brilliant illustration is by Akire Bubar. This is one of those days that I wish did not happen in my business life very often – there’s so many balls in the air I’m afraid I’ll lose track! A more experienced business person would probably advise me not to mention anything with a possible negative bent. I prefer to keep things real, however, because as a customer, I appreciate it when small business owners (including authors and other creators) present proof of their humanity. (I use the phrase for the lack of a better term). You know: that I’m dealing with an actual person who is capable of handling unexpected situations without forgetting their own plans, dreams, likes and dislikes or strengths and weaknesses. So here goes. You’ll have to imagine another two feet of the same to the right of the picture, and a stack on the floor, the armchair and the sofa. There’s even a stack behind the laptop. And this is just the paperwork I’m currently working on; I have supplies lying around on the rest of the horizontal surfaces and on the floor. I feel overwhelmed. I was sick for two weeks earlier this month. Why did it take so long?! I am so behind with my plans! I’ve been researching my very first tax return as a business owner. It’s a massive undertaking, and there’s no possible way on this earth I can do it! My office needs rearranging badly. For one, I need adequate storage for my tax and other business files (which until now have been minimal). And it’s like a hurricane struck! There are a few personal life tasks I need to schedule and handle, but no time ever seems convenient! I got a business proposition from an unexpected quarter. It’s intriguing, but I know nothing about the potential business partner in question. Now I have to research the details of the proposition, the potential partner and the costs and work involved – on top of all of the above! Everything Else that’s been on the back burner is never gonna get done at this rate! The good thing is, the feeling has forced me to get in gear, fetch my serious-person-analytical-brain and find solutions. That’s what the pragmatics of business life are, after all: solving problems and finding solutions. It has actually helped enormously to think of my task list as problems in the academic sense instead of this mass of seething, monstrous important-business-stuff&things-that-I’m-not-qualified-to-do-omg. I’m an academic, so I’m used to problems. The only thing is that the problems I’m facing now are of a different kind than what I’ve dealt with before. It’s natural that it’ll take me a while to adjust. Stop beating myself over taking the time to get well. Two friends from my area were sick earlier this month, too, and now they’re sick again. If the viruses going around are that persistent, I was right to take care of myself. >> Life will adjust. Break the tax return into smaller steps. Research one at a time. If a step turns out to big, break it into smaller steps. Read the pertinent IRS brochures, making copious notes. Learn the vocabulary and definitions. Reward myself in between each step. Rinse & repeat. Then, find help to make sure I’ve got it right. >> I’ve started. Find help. Maybe my Google-fu is not deficient, but the instructions given to the public. >> Started this one, too. The inventory is mostly done. What needs doing is making sure the tax return and paperwork requirements are met – see 3, above. >> It will take work, but that’s doable. Not. A. Problem. Srsly. >> Just pick the least convenient time and roll with it. Cooperation along these lines is actually in my future plans; it just arrived a little sooner than I thought. Again, break the research into steps. Do the math; make the prototype; estimate production schedules. Besides, I saw nothing in the preliminary details that’s time-sensitive, which means I can probably negotiate the timing if I decide to go for the deal. >> And I’ve started this, as well, I’m proud to say. Such is life. >> Whittle the list down one item a day, if that’s what it takes. It will get better. Edit: Last paragraph edited for clarity. Making Progress: Ready for the World! Getting your products out into the world involves quite a few tasks. Making and photographing your items – apart from the initial plan and design – are just the first steps in the process. Packaging is an important step that ties in with regulations, branding and customer service. It took me several days of research, thinking and experimenting to come up with a solution that I’m happy with. As per the federal Textile and Wool acts, I had to include fiber content, manufacturer and country of origin information. I also wanted to include care information. I wanted something that both takes my branding (logo / font) into account and is pleasing to the eye. Finally, I absolutely wanted my textiles to be protected from the elements during shipping. And I wanted simple packaging. Quite a few requirements, don’t you think?